The Player's Handbook(TM) Heroes: Series 1 expansion for the Dungeons & Dragons Roleplaying Game features high-quality miniatures representing iconic player character races and classes described in the Player's Handbook(R) and Player's Handbook 2 core rulebooks. There are six booster packs in all: 2 packs of martial heroes, 2 packs of arcane heroes, 1 pack of divine heroes, and 1 pack of primal heroes. 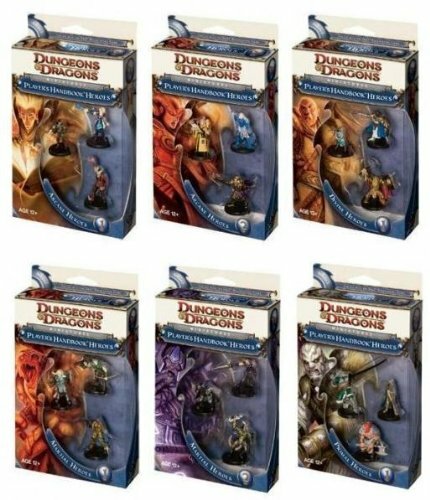 This case pack contains all 6 individual packs, each with 3 visible, high-quality, non-random plastic miniatures representing D&D® player characters plus an exclusive power card not available elsewhere! Each miniature comes beautifully painted and fully assembled.